The first part is here. As a reminder, Sled is an embedded database engine written in Rust. It takes a very different approach for how to store data, which I’m really excited to see. And with that, let’s be about it. In stopped in my last post when getting to the flusher, which simply sleep and call flush on the iobufs. The next file is iobuf.rs. And we have IoBufs struct, which contains the single buffer. Personally, I would use a different name, because is is going to be very easy to confuse them. At any rate, this looks like this is an important piece, so let’s see what is going on in there. Both of them looks interesting / scary. I can’t tell yet what they are doing, but the “interesting thread interleaving” stuff is indication that this is likely to be complex. This test to see if the snapshot provided is big enough to be considered stand alone (I think). 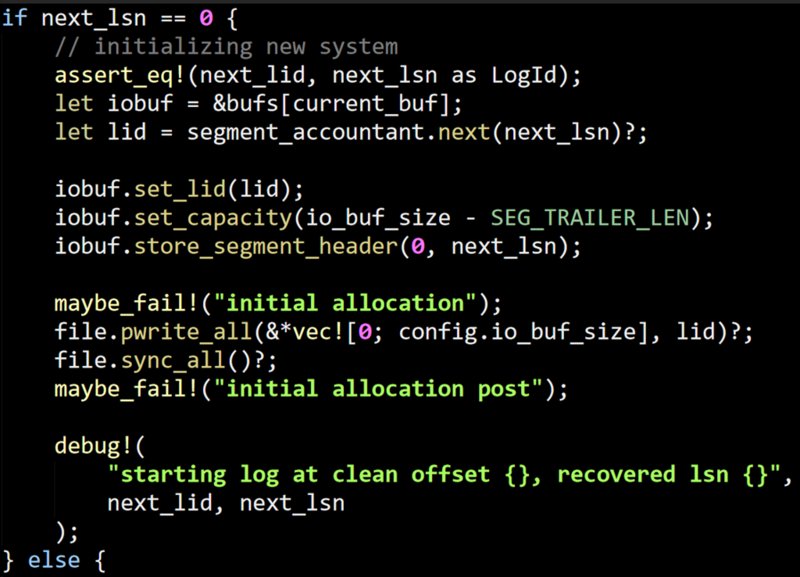 You can see that we set the next_lsn (logical sequence number) and next_lid (last id? logical id?, not sure here). So far, so good. But all of that is a single expression, and it goes for 25 lines. The end of the else clause also return a value, which is computed from the result of reading the file. It works, it is elegant but it takes a bit of time to decompose. You can see that we make some writes (not sure what is being written yet) and then sync it. the maybe_fail! stuff is manual injection of faults, which is really nice to see. The else portion is also interesting. This is when we can still write to the existing snapshot, I guess. And this limits the current buffer to the limits of the buffer size. From context, lid looks like the global value across files, but I’m not sure yet. On its own, it isn’t really that interesting. I guess that I don’t like the unwrap call, but I get why it is there. It would significantly complicate the code if you had to handle failures from both the passed function and with_sa unable to take the lock (and that should only be the case if a thread panicked while holding the mutex, which presumably kill the whole process). Sled calls itself alpha software, but given the number of scaffolding that I have seen so far (event log, debug_delay and not the measurements for lock durations) it has a lot of work done around actually making sure that you have the required facilities to support it. Looking at the code history, it is a two years old project, so there has been time for it to grow. 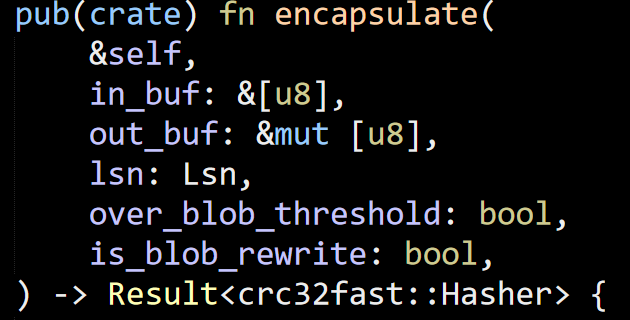 What this method actually going on in here is that based on the size of the in_buf, it will write it to a separate blob (using the lsn as the file name). If the value is stored externally, then it creates a message header that points to that location. Otherwise, it creates a header that encodes the length of the in_buf and returns adds that to the out_buf. 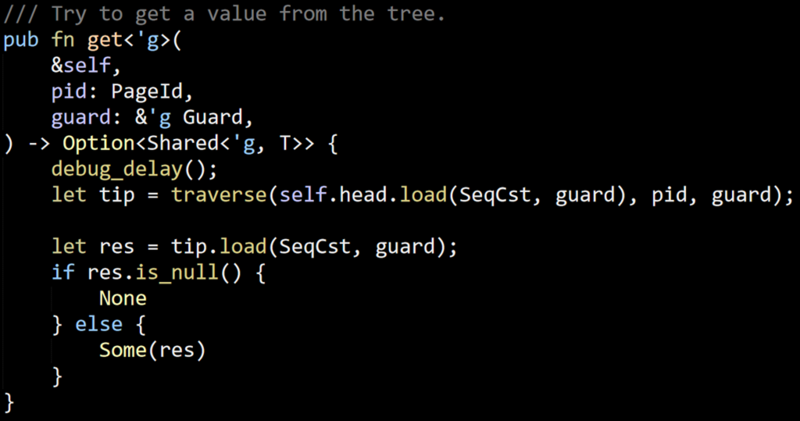 I don’t like the fact that this method get passed the two bool variables. The threshold decision should probably be done inside the method and not outside. The term encapsulate is also not the best choice here. 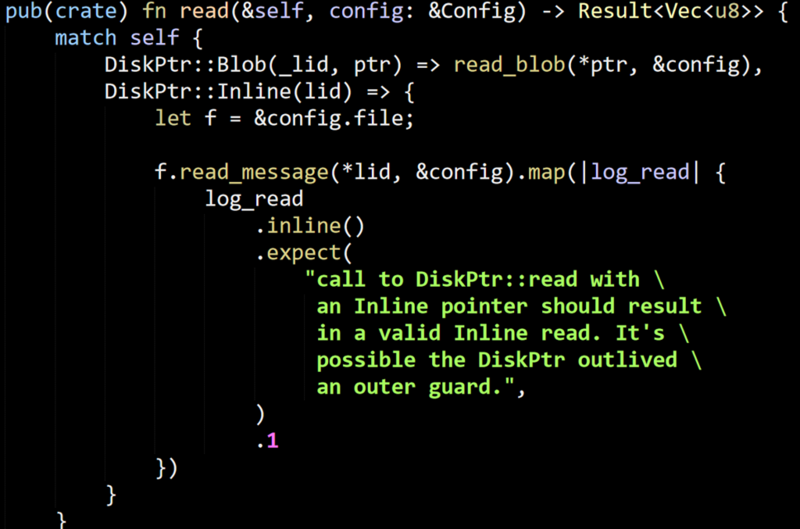 write_msg_to_output would probably more accurate. The next interesting bit is write_to_log(), which goes on for about 200 lines. This takes the specified buffer, pad it if needed and write it to the file. It looks like it all goes to the same file, so I wonder how it deals with space recovery, but I’ll find it later. I’m also wondering why this is called a log, because it doesn’t look like a WAL system to me at this point. It does call fsync on the file after the write, though. There is also some segment behavior here, but I’m used to seeing that on different files, not all in the same one. 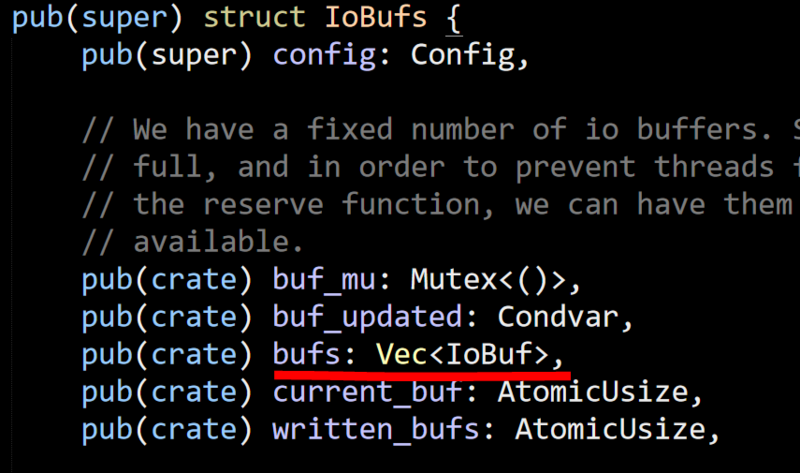 It seems that this method can be called concurrently on different buffers. There is some explicit handling for that, but I have to wonder about the overall efficiency of doing that. Random I/O and especially the issuance of parallel fsyncs, are likely not going to lead to the best system perf. Is where the concurrent and possibly out of order write notifications are going. This remembers all the previous notifications and if there is a gap, will wait until the gap has been filled before it will notify interested parties that the data has been persisted to disk. Because I’m reading the code in a lexical order, rather than in a more reasonable layered or functional approach, this gives me a pretty skewed understanding of the code until I actually finish it all. I actually do that on purpose, because it forces me to consider a lot more possibilities along the way. There are a lot of questions that might be answered by looking at how the code is actually being used in parts that I haven’t read yet. At any rate, one thing to note here is that I think that there is a distinct possibility that a crash after segment N +1 was written (and synced) but before segment N was done writing might undo the successful write for N+1. I’m not sure yet how this is used, so that is just something to keep in mind for now. If you’ll recall, this is called on a timer to write the current in memory state. This looks like it is racing with other calls on trying to write the current buffer. I’m not so sure what sealed means. I think that this is to prevent other threads from writing to the same buffer while you might be trying to write it out. That is enough for now, it has gotten late again, so I’ll continue this in another post. The Sled project is an embedded database written in Rust. I run into it a few times recently and given my day job, I decided to take a peek and understand how it works. The project talks about being Log Structure Merge (and also exposing this to the client) with B+Tree read performance. The last time I read an LSM codebase was quite some time ago, so this is going to be quite interesting, I hope. 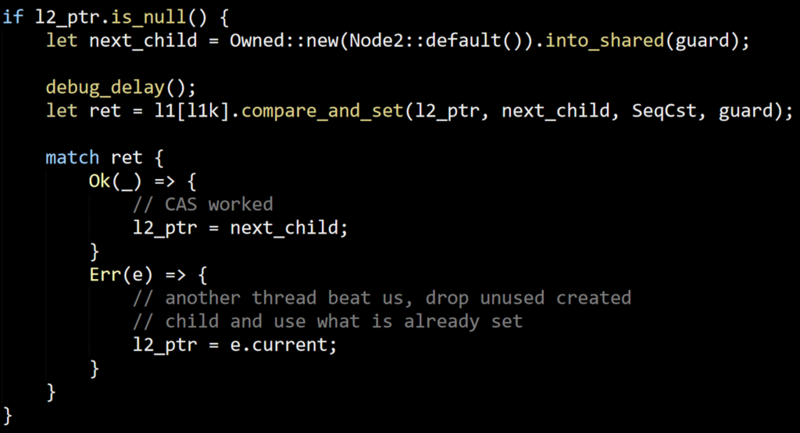 As usual, I’m doing a stream of consciousness as I’m going through the code. I’m looking at commit 6ce3e1264d3bb46de768e8fe338bade02d0b30dc. The fact that there is a page cache component already tell me quite a lot about the project. That is uses pages (LevelDB does not, for example) and that it is cached (so likely not using mmap). That will likely be important later, but when starting out I enjoy jumping to conclusions and then seeing if I was right or not. This is quite interesting. Mostly because this shows a very different approach to building a page cache. 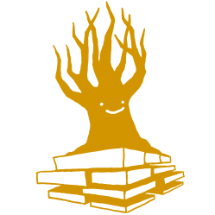 It isn’t your usual B-Tree page, it seems. The docs reference LLAMA a lot, but I would rather go through the code first and read scholarly articles later. As usual, I’m going over the code in lexical order, which means that the first real code file that I run into is a Rust implementation of doubly linked list. Nothing really interesting there, except massive amounts of unsafe code, so I’m going to skip to it’s usage, which is to implement a least recently used cache. There are N shards, determined by the configuration of the system. This is controlled by cache_bits, where 2^CacheBits is the actual size. I’m not sure why the code uses this methods instead of just a number. 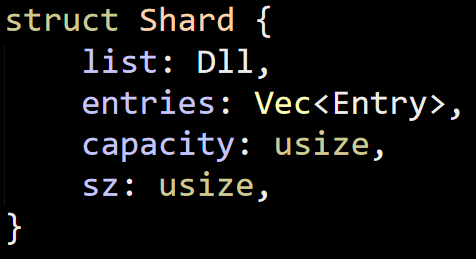 The codebase contains the values 0, 2 and 6 for cache_bits, giving us 1 shard, 4 shards and 64 shards, respectively. I assume that they use this to reduce contention on the same Shard instance for concurrent operations. Note that capacity is actually the max capacity, not reserved space in the entries vector. Each entry contains the actual size that it is using, as well and the Node itself (that reside in the LRU). The actual value that is kept is a PageId, which is the native integer type for the platform (32 bits – 4 bytes / 64 bits – 8 bytes). I’m not sure yet if this is a persisted value, but for something that is meant to be used in a persisted store, I find that choice very strange. It means that on 32 bits machine, you can only use 4 billion pages, while 64 bits there is much higher limit. That means that a database created on 64 bits might not be valid for 32 bits. When building Voron, we were very careful that data will be the same in 32 bits and 64 bits, Windows / MacOS / Linux, etc. When you call accessed on the Shard, it will add it to the list, and if the size of all entries is higher than the capacity, will remove entries until the size in the cache is smaller than the maximum capacity. Interestingly enough, Sled is using an Epoch based GC system in Rust, implemented by Crossbeam. I wrote about Epoch systems when I reviewed FASTER, and I understand that Epoch GC is pretty common in Rust concurrent programming, because otherwise you run the risk of memory corruption. 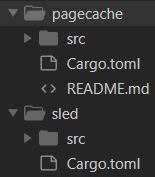 The ds (I assume data structure) folder of the page cache also provide a concurrent Stack implementation, which it pretty elegant to read, but you need to be well versed in the Epoch handling to understand how it all works correctly under the covers. The top of the file mention that this assume that the caller is going to have a dense key space, and this make sense. Theoretically, this will use a maximum of 512GB if you store a sparse set of data in the page table. All the operations in the page table are some variant of the traverse operation, so let’s focus on that. First, the key is split to the first 18 bits (0 .. 256K) and the rest of the value. The first part is used to find the level 1 value. 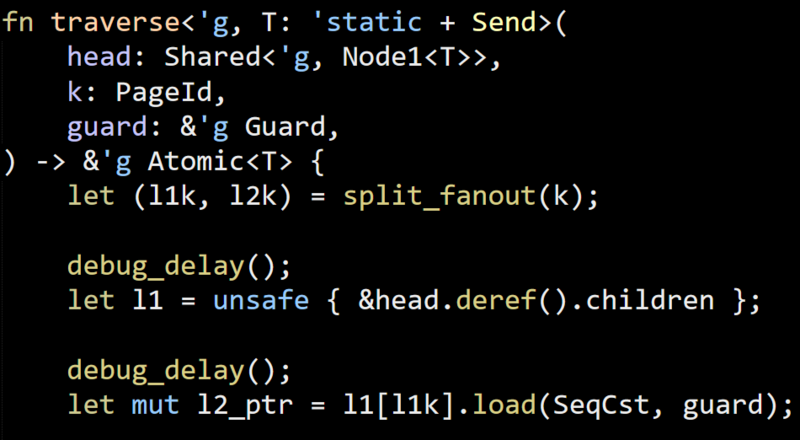 The debug_delay() calls are debug only calls that add random waits, which help catch race conditions. Given that the code uses explicit Atomic instructions, I’m not surprised to see that there is really no help from the Rust safety behavior to ensure that there aren’t any logical race conditions. This is the first time I’m reading real Rust code that explicitly deal with concurrency (without using the hammer that is Mutex, at least), and it is… reassuring seeing the same kind of behaviors that I’m injecting into my code to validate things. Look at the comment when we fail to win the compare_and_set call. Who is actually going to drop the unused created value? That is on the Guard and Epoch, I think. We associated the value with them when we called into_shared, and since we didn’t take it out from the guard, it will be removed when the Epoch is over. Note that this may be an empty value, so let’s see how this actually get used. I’m using the simplest caller, which is get(). You can see that we have to do explicit null checking, translating that to an Option call to make calling code idiomatic. The rest of the code there is just memory management, so I’m going to skip that and look at the rest of the pagecache code, now that I understand the underlying data structures. Note, the code uses the Lsn as a logical type name, this maps to a 64 bits signed integer. The first file in the pagecache crate is the blob_io one, which handles reading blob. Here is the (crate public only) functions that are implemented there. Remember, LSN is the (Logical Sequence Number) and is a signed 64 bits integer. Config I’m not sure about at this point. The read_blob and write_blob are fairly simple. They just read / write (with CRC32 checks) data from disk. This is done on a full file each time. So that is quite interesting. The Config is responsible for mapping between an LSN and a file path. The call to remove_blob will simply delete the mapped file from the disk, but it is the call to gc_blobs that is really interesting. What this does is to basically delete all the files whose name is greater than the stable_lsn provided. This is interesting, because it tells us a lot about the actual on disk persistent format. Based on just the blob_io.rs file, I can tell that Sled is writing fairly large files to disk and reading them to memory. It is probably going to call gc_blobs() as part of its recovery and I’m willing to assume at this point that each blob is actually a segment. As I said, I like assuming things upfront when doing this kind of code reviews. I’m going to continue my reading and see if I was right. So that is really interesting. First, we can see that Sled is probably only calling fsync once in a while, depending on its configuration. I looked into a real world project, and it uses the default value, which is flush every 500 ms and snapshot after 1 million. The reason this is interesting is that my experience tells me is that whenever I see a configuration option like that, it means that fsync is going to be pretty expensive and the database engine has chosen to allow users to trade performance for safety. Voron, in contrast, actually don’t have any such feature. We don’t allow users to make that choice, instead, we accepted the fsync costs and dealt with them (using async commit and transaction merging, for example). So this is pretty much just as expected. The data for each blob is a separate file under the blobs directory. Now we are only left with figuring out what that blob was. So that allow us to make sense of what is going above. Basically, this is “gimme some bytes” call, regardless of where this is actually stored (which I don’t know yet). The next file is event_log, and it is a debug tool to help verify the behavior of the system. I wholeheartedly approve and it is a really good sign for the maturity of the codebase. There is nothing of interest in there, but it does indicate no coordination between flushing and other activities. Not sure whatever this is a good or bad idea. Now, let’s see what this iobuf is all about, shall we? And I can’t really figure this one out. I mean, why? Just setting InnerLsn = i64 should be good enough for all platforms, I think. I guess there might be some optimizations stuff that I’m missing, but that seems unlikely. In 64 bits, I would expect isize and i64 to have the exact same behavior. This is now getting pretty late, so I’m going to close this for today. Tomorrow, I’m going to try to figure out how the rest of it works.